We arrived to a flop of Q♣ J♦ 7♥ and about 1700 in the middle and 5 players, so we’re guessing there was a raise to 300 somewhere in there. John Alexander in the SB checked, as did the BB. Kevin McMahon wagered 750, to which he was called by the button and Alexander. The 3 players discarded a card, and got greeted by a 5♦ turn card, which was checked around. A 3♥ on the river resulted in Alexander checking, and McMahon betting 750. The button and Alexander both mucked their cards, and McMahon has upgraded his stack to around 15,000! 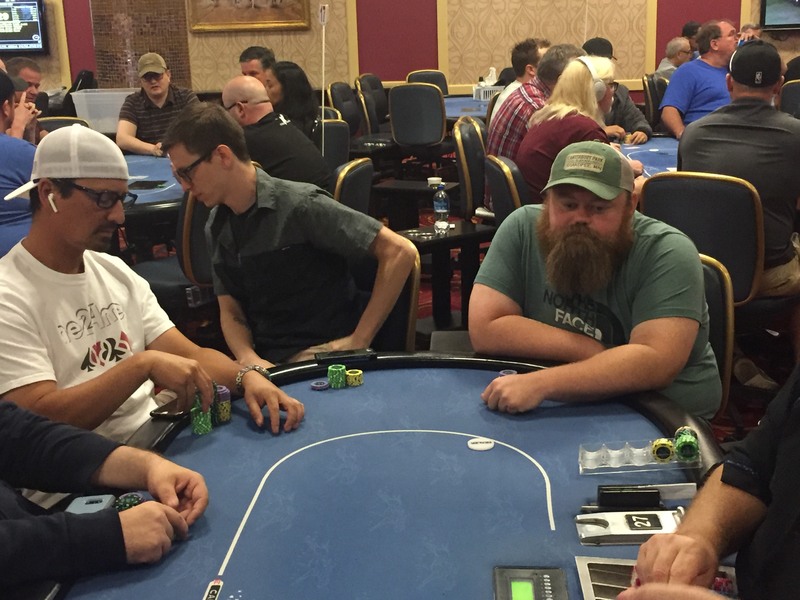 Seated with immediate position on Mark “Loki” Abboud and Max Havlish, is Kyle Jacobson. We observed a hand where a mid position player called, as did Loki and Havlish in the CO and button, and Jacobson as well who completed from the SB. The BB checked his option. A flop of K♣ 4♦ T♠ got checked around by all 5 players, who then made their discards. On the turn of a Q♣, Jacobson lead into the field for 300. He got called by only the BB. The river of a 4♥ warranted a 600 bet from Jacobson, who got the fold from his BB opponent. One sidenote to this table: Loki told us, “there have been 29 hands dealt here so far, and I’ve played 29 hands.” Living up to his name! Jake Kappel limped in from early position, as did the CO, button, and both blinds so we went 5 ways to a flop of A♦ T♥ 3♠. Action checked to him and he bet 300, and got called by the player in the CO. Both players then made their discards. A board pairing T♣ appeared on the turn, to which both players checked. On the 5♠ river, Kappel bet 700, and his opponent quickly folded. 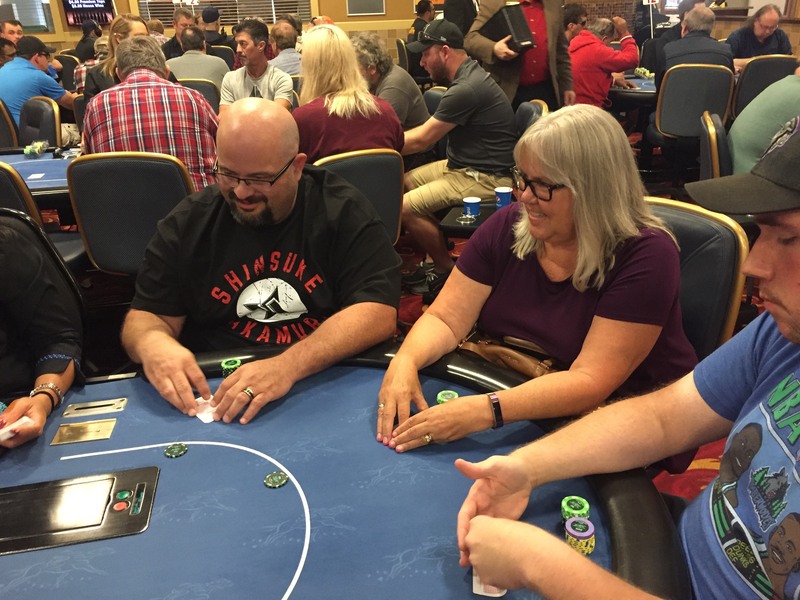 Michelle Day limped UTG, and folded around to Scott Overby on the button who made it 200. The SB called, as did Drew Lee in the BB and Day UTG. A flop of T♦ 9♣ 8♣ got checked around, as did the 7♥ turn. On a J♣ river, the SB bet, and Drew Lee fired out 600 from the BB. Michelle Day called, as did the SB. Lee tabled K♣ Q♦ for a king high straight. Not to be outdone, Day tabled K♠ Q♥ for the same hand. The small blind mucked. $100 NL “Crazy Pineapple” is HERE! ALL three tournaments this weekend benefit Ronald McDonald House – Upper Midwest, with ~5% of the prize pool going to them. See the structure sheet for specifics. Three lucky winners are going to walk out of this weekend taking home these beautiful looking trophies, will one of them be you? 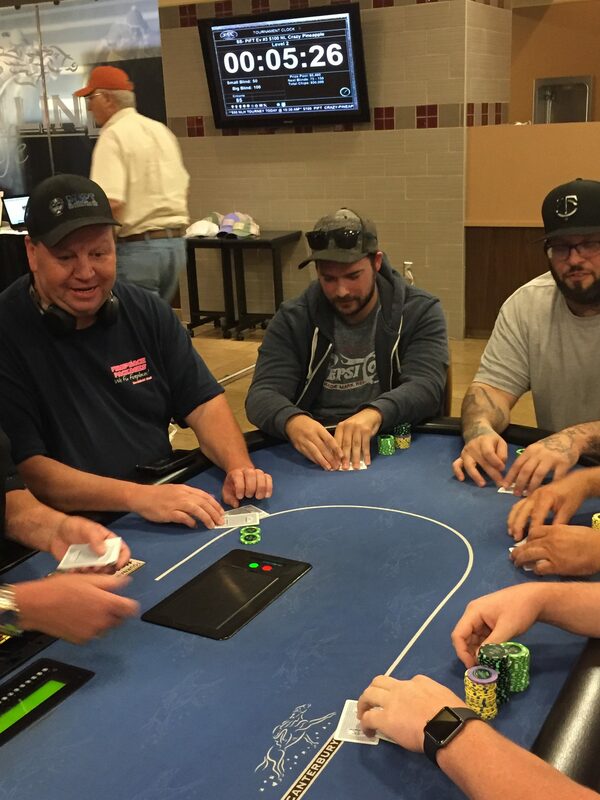 Last night we had a rad $250 NLHE “Winners Shown” tournament that drew 129 entrants. Check out the entire tournament updates here. 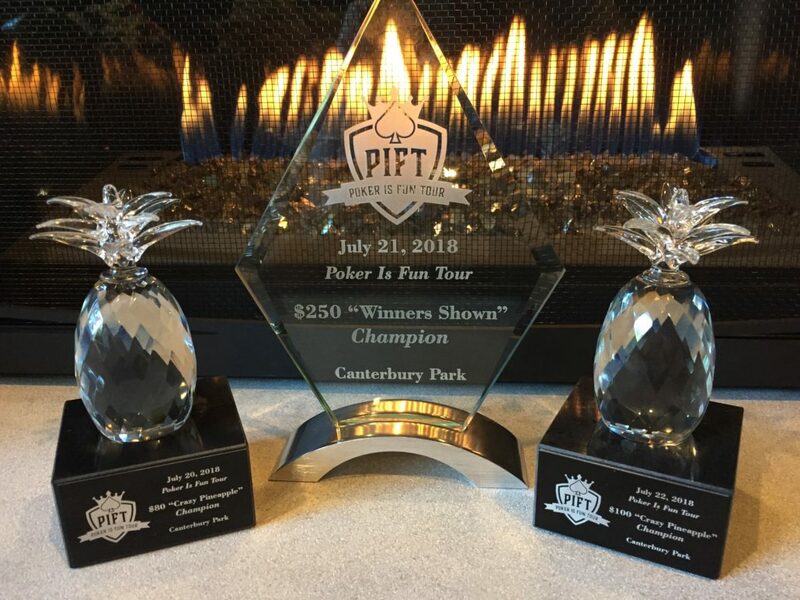 Two nights ago, our $80 NL “Crazy Pineapple” drew 215 entrants, and you can view all those live updates here. With two events complete, we’ve unofficially raised $7,688.60 already, between the money taken out of prize pools, and many generous pledges and donations from players! If you’d like to donate as well, feel free to locate Mike Schneider or one of the floors!! 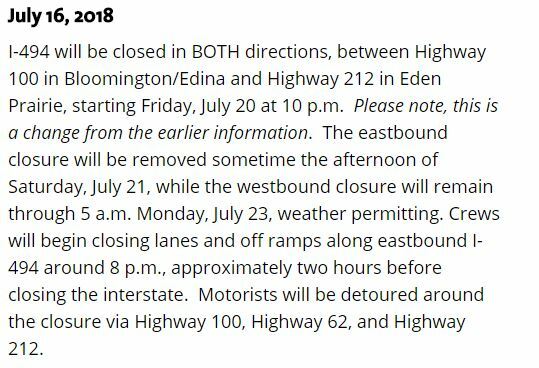 We recommend figuring out alternative routes if you typically travel I494 through Bloomington. Warped Tour is at Canterbury 11am-9pm on Sunday, July 22. This means that our Sunday tournament that starts at 12:30pm will likely have tricky parking at Canterbury, so plan accordingly and allow yourself a few extra minutes to arrive to Canterbury and get inside! Lastly, while you wait for this weekend’s events to get underway, why don’t you check out our archived coverage from last fall’s two “Winners Shown” events we held at Canterbury Park, which benefited Second Harvest Heartland to the tune of $2,472.30. http://www.piftpoker.com/wp-content/uploads/2017/04/pift-logo.png 0 0 Schneids http://www.piftpoker.com/wp-content/uploads/2017/04/pift-logo.png Schneids2018-07-22 12:44:262018-07-22 12:44:26$100 NL "Crazy Pineapple" is HERE!